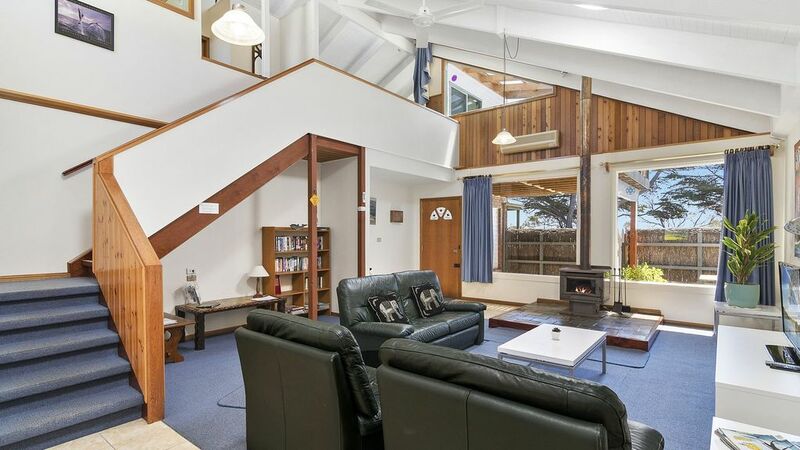 WATERFRONT TOWNHOUSE- Offers a one or two bedroom townhouse overlooking the tranquil waters of Westernport Bay and Phillip Island. San Remo is a fishing village with a romantic atmosphere , that is only enhanced by this unique apartment. Well positioned just a short walk along the waters edge to the San Remo jetty , cafes, restaurants and retail area. Every morning at 11-30 am watch the pelicans being fed at the jetty and view the fishing boats. The Black Dolphin Townhouse offers a good location, with views from the balcony and bedroom . It is a Architect design 15 sq two storey self-contained apartment with a open living area, offering one or two very bedrooms with queen size beds (plus a 2 single). Ideal for one or two couples or family. A large open living area is complemented with facilities including, leather lounge, flat screen television, video, wood heater and reverse cycle air conditioner. If you wish to eat in the kitchen, it is well appointed with all appliances and fully equipped. Two bathrooms one upstairs and one downstairs well fitted out, including a double spa. Fully equipped laundry is provided. Front and rear private courtyards with a covered veranda over barbecue and table setting. San Remo is situated on a peninsula and is the gateway to Phillip Island and is where the bridge connects it to the mainland.Being a peninsula San Remo is surrounded by water,with a back beach and town beach being a 10 min stroll away and safe for all the family,while a short drive will take you to the pristine beaches of Phillip Island,starting with Cape Woolamai.The attractions of Cowes, Seal Rocks, Nobbies , Penguins , Race Track, Golf Course and Koala Park are all only 10 min drive away. Thanks Samantha for your review, we are so glad that you enjoyed your stay in the Townhouse. We enjoyed our stay at the Black Dolphin. The owner was very attentive to our needs. The beds were comfortable and amenities met our needs. The townhouse was very a short distance to San Remo shopping strip - we walked there every morning for coffee and a play in the children's playground. The wood heater was used every night and just made the stay relaxing and enjoyable. Very happy that we choose this excellent townhouse (based on previews reviews), it definitely exceeded our expectations. Townhouse is very clean and have enough space for two adults and two kids. It had everything we need, nice kitchen, SPA, comfy beds, bay view and close to everything. One thing we really liked about the house was that all the items in the house are really good quality. Only negative/downside is that in the morning, road get bit noise with traffic. Overall we really enjoyed our stay and will definitely stay here again or will recommend any one visiting Philip Island. One of the best stays we had and will definitely pick the same place for a return or may be an upgrade to Nigel's other property (Oceanfront). 4. Good clean bedrooms, bathrooms and kitchen. 4. Kitchen has all the required amenities. Anything that we don't like? Black Dolphin waterfront townhouse has large and clean space and excellent location with bay views. Nigel has offered good services.